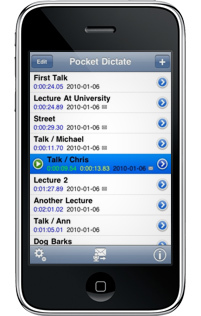 Pocket Dictate features record and playback dictation all in the palm of your hand. For ease of use, operation is designed to closely mimic that of old style dictation recorders. You can playback, rewind, insert or overwrite as required with a tap of your finger and send completed audio dictations to your typist. 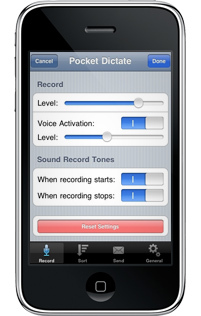 Pocket Dictate is a voice recorder for the iPhone. You dictate directly on your phone. When done, tap send and the dictation will be compressed, encrypted and sent to your typist by email automatically.